Johns Hopkins researchers have developed a jelly-like material and wound treatment method that, in early experiments on skin damaged by severe burns, appeared to regenerate healthy, scar-free tissue. In the Dec. 12-16 online Early Edition of Proceedings of the National Academy of Sciences, the researchers reported their promising results from mouse tissue tests. The new treatment has not yet been tested on human patients. But the researchers say the procedure, which promotes the formation of new blood vessels and skin, including hair follicles, could lead to greatly improved healing for injured soldiers, home fire victims and other people with third-degree burns. 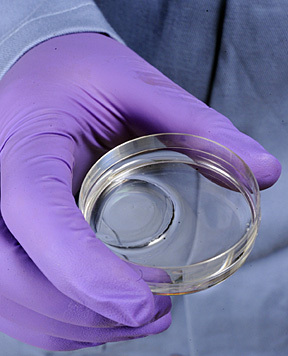 The treatment involved a simple wound dressing that included a specially designed hydrogel—a water-based, three-dimensional framework of polymers. This material was developed by researchers at Johns Hopkins’ Whiting School of Engineering, working with clinicians at the Johns Hopkins Bayview Medical Center Burn Center and the Department of Pathology at the university’s School of Medicine. Third-degree burns typically destroy the top layers of skin down to the muscle. They require complex medical care and leave behind ugly scarring. But in the journal article, the Johns Hopkins team reported that their hydrogel method yielded better results. “This treatment promoted the development of new blood vessels and the regeneration of complex layers of skin, including hair follicles and the glands that produce skin oil,” said Sharon Gerecht, an assistant professor of chemical and biomolecular engineering who was principal investigator on the study. If the treatment succeeds in human patients, it could address a serious form of injury. Harmon, a coauthor of the PNAS journal article, pointed out that 100,000 third-degree burns are treated in U. S. burn centers like Bayview every year. A burn wound dressing using the new hydrogel could have enormous potential for use in applications beyond common burns, including treatment of diabetic patients with foot ulcers, Harmon said. Gerecht says the hydrogel is constructed in such a way that it allows tissue regeneration and blood vessel formation to occur very quickly. “Inflammatory cells are able to easily penetrate and degrade the hydrogel, enabling blood vessels to fill in and support wound healing and the growth of new tissue,” she said. For burns, the faster this process occurs, Gerecht added, the less there is a chance for scarring. Originally, her team intended to load the gel with stem cells and infuse it with growth factors to trigger and direct the tissue development. Instead, they tested the gel alone. “We were surprised to see such complete regeneration in the absence of any added biological signals,” Gerecht said. Gerecht and Harmon say they don’t fully understand how the hydrogel dressing is working. After it is applied, the tissue progresses through the various stages of wound repair, Gerecht said. After 21 days, the gel has been harmlessly absorbed, and the tissue continues to return to the appearance of normal skin. The hydrogel is mainly made of water with dissolved dextran—a polysaccharide (sugar molecule chains). “It also could be that the physical structure of the hydrogel guides the repair,” Gerecht said. Harmon speculates that the hydrogel may recruit circulating bone marrow stem cells in the bloodstream. Stem cells are special cells that can grow into practically any sort of tissue if provided with the right chemical cue. “It’s possible the gel is somehow signaling the stem cells to become new skin and blood vessels,” Harmon said. Additional co-authors of the study included Charles Steenbergen, a professor in the Department of Pathology; Karen Fox-Talbot, a senior research specialist from the Johns Hopkins School of Medicine; and physician researchers Xianjie Zhang, Raul Sebastian and Maura Reinblatt from the Department of Surgery and Hendrix Burn and Wound Lab. 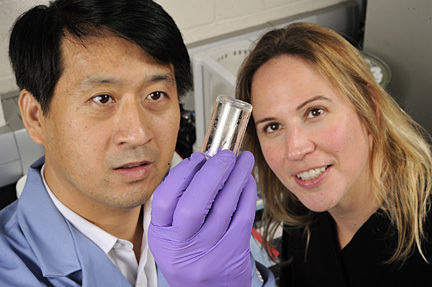 From the Whiting School’s Department of Chemical and Biomolecular Engineering, other co-authors were doctoral students Yu-I (Tom) Shen and Laura Dickinson, who is a Johns Hopkins Institute for NanoBioTechnology (INBT) National Science Foundation IGERT fellow. Gerecht is an affiliated faculty member of INBT. The work was funded in part by the Maryland Stem Cell Research Fund Exploratory Grant and Postdoctoral Fellowship and the National Institutes of Health. The Johns Hopkins Technology Transfer staff has filed a provisional patent application to protect the intellectual property involved in this project. Digital color images of the researchers and the hydrogel available; contact Mary Spiro or Phil Sneiderman.